You should be receiving an email soon with a link to download your Witch’s Rock trip guide. You can also download our trip guide by clicking here. Since 2001 Witch’s Rock Surf Camp has helped thousands of happy guests by providing surfing vacations that are FUN and AFFORDABLE. 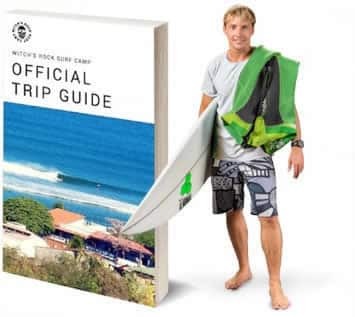 Please fill out this form and we will customize your surf trip and quickly send you a no-obligation quote. Our office is open 9AM-10PM Monday- Friday, 9AM-5PM Saturday, and 12-8PM Sunday. It only takes a minute to check availability and get a quote. We can also help you find flights and answer any other questions. From the moment you show up at the airport, throughout your entire week, and until we finally say goodbye, WE MAKE IT EASY. All you have to do is show up and we take care of everything: your airport shuttle, hotel, food, surfboards, lessons, tours, seminars, and activities. We hope you travel safe and we look forward to sharing some waves.